A capacity crowd of 20,000 was in attendance in the hope that United could overturn a respectable 1-0 defeat from Prague. United had dominated much of the play in the away leg so the home fans turned up in confidence that a positive outcome could be achieved. The large crowd looked to actually yin-nerve United in the opening exchanges with many half-hit passes going astray. Milne could have dispelled the nerves in five minutes when he took a Dodds pass and hammered a shot which Hruska did well to hold. Then a Sturrock-Gough-Dodds combination finished with Dodds shooting over the bar. Sturrock who passed a late fitness test was looking sharp. However, he missed a real chance when put through by a great Kirkwood pass. He shot past the right-hand post from 12 yards. The Czechs, with the wind behind them managed their first shot in 22 minutes when a Zelensky effort flew wide.Then it was back to the other end and a Milne free-kick was met by Gough. His knock down to Dodds, gave the striker a headed chance but it went straight into the goalkeepers arms. Levy was booked for deliberate handball after 50 minutes as the second half continued in the same vein as the first half. With 20 minutes of the second half gone, United put on forward, John Reilly, for a defender, Derek Stark, as they prepared for a final push. Almost immediately Reilly was brought down just outside the box and from the free-kick Sturrock nodded the ball to Hegarty whose header went tantalisingly inches over the bar. In the last quarter of an hour the Taysiders put the Czech defence under immense pressure, but the brilliance of 'keeper Hrusk denied them with a succession of wonder saves. Paul Hegarty was pushed up front with around 8 minutes remaining but to no avail. The last chance fell to Kirkwood, but the 'keeper was a good match to the effort and saved comfortably. United primarily failed to get the goal breakthrough they required because wingmen Ralph Milne and Eamonn Bannon failed to carve the necessary openings. 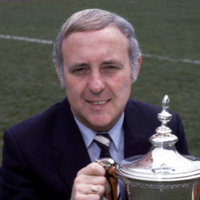 It was a night of bitter frustration and disappointment for the capacity 20,000 crowd at Tannadice for, on the night, Bohemians looked a very ordinary side. 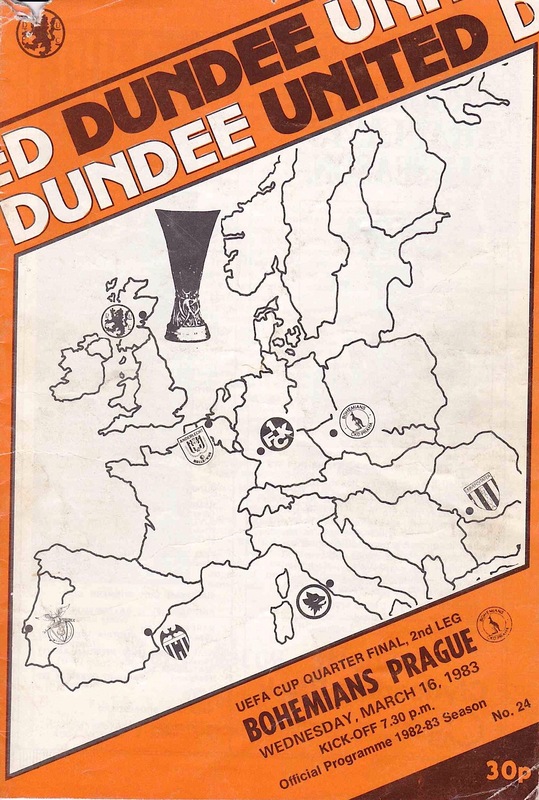 Dundee United fell at the UEFA Cup quarter-final stage last night for a sad second year in a row. It has to be said this was not one of United's better displays. There could have been no faulting their effort or endeavour, but luck deserted them. Tonight is arguably the biggest in the history of the club and we are desperate to reach the semi-final stages. I feel the players who, particularly earlier in the season, have been superb and deserve further European success. I am, also, equally anxious to secure a semi-final p!ace to repay your magnificent support. 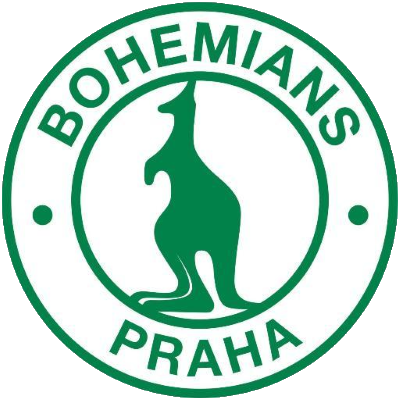 Whilst I wouldn't disagree we start as favourites to beat Bohemians, I must repeat that we have to be conscious that European football is about prising open defences, not hitting long balls and hoping. The players will require your full vocal backing and patience to enhance our chances. Obviously at this stage of a European tournament class performances will be necessary from several players. Organisation and work rate will not be sufficient. Unfortunately Dave Narey who, for half the season was at peak form, is, by his own standards, going through a bad patch. At the time of writing Paul Stufrock is extremely doubtful, but he, too, has been suffering a lapse in form. Hopefully, Paul will make it, but irrespective of what it will require all the players, playing to their full potential to see us through. No doubt like most of you, I was satisfied with the end product following our latest 'derby' encounter, but not the overall performance. 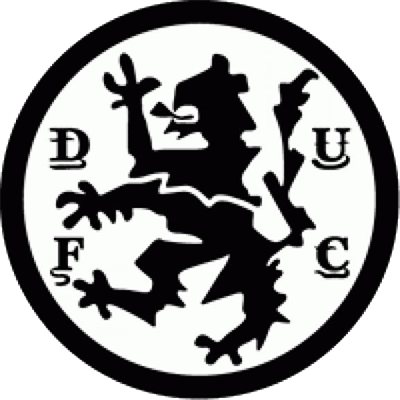 Our passing and general build up deserted us and our below par display almost gave Dundee victory. However, at the end of the day we have beaten our neighbours four times in four meetings (including the Forfarshire Cup) this term and that is the most important factor. Win, lose or draw either tonight or in the crucial League clash at Pittodrie in three days time, we must sort out the midfield department. Not enough responsibility is being taken in that area to dictate the game when we have possession of the ball. Only when the opposition have the ball are the midfield men showing the necessary fight but the two vital matches ahead rule out any immediate experiments. However, we must seek an improved midfield blend for, hopefully, the European semi-finals and a continuing League challenge.